Alright, I’m going a little bit mainstream here as I stumbled upon this artist whilst reading Vogue (I was at a hair salon. Beauty magazines happen). But for once in my life, I was actually pleased that whilst flipping among various ads of half-naked women, I found a little mini article on Chiharu Shiota’s installation entitled ‘Room of Memory’. I won’t lie. Her work makes me a little bit excited. The reasons? Well, dear Sir. Or Lady. I shall tell you. It’s CLEAN. Clean in the sense that it has extreme detail and character, but there is a simple concept that hands you complex ideas. And she is intense. 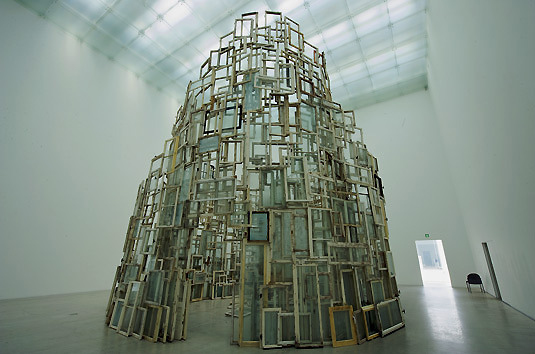 God-willing the day when if I am ever able to experience her installations first hand, but for now, I can only imagine walking into this tower of window frames, instilling an immediate sense of nostalgia upon entering. And who doesn’t love a good dose of nostalgia? 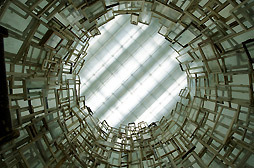 Other pictures of the installation ignite a sense that you are standing within the eye of a tornado. Within the eye of all your memories? 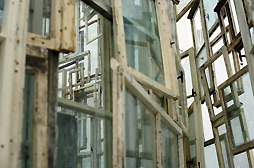 Within the midst of your entire life full of blank and empty window frames, ready and willing for your imagination and sub-conscious to fill them with YOUR life? An installation available for anyones interpretation. 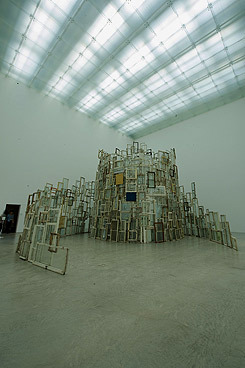 Art Jargon: Culturebase.net tells me “The young Japanese artist Chiharu Shiota deals generously with her dreams. Her installations and performances lead into sleep, night and the self-forgetfulness of the dreaming body. Far from Japan, her loss of orientation and her fear of losing the personal and individual have become the leitmotifs of her art. From them arise theatrical images inviting viewers´ participation.” Fetching, no? My love for Japanese minds never ceases to fail me. Read Haruki Murakami while your at it.